Have you been interested in joining a Research Like a Pro Study Group, but worried about the time commitment? Perhaps the dates didn’t work for you or you were nervous about receiving peer feedback on your work. The Research Like a Pro e-Course has proven to be the perfect solution for researchers like you. 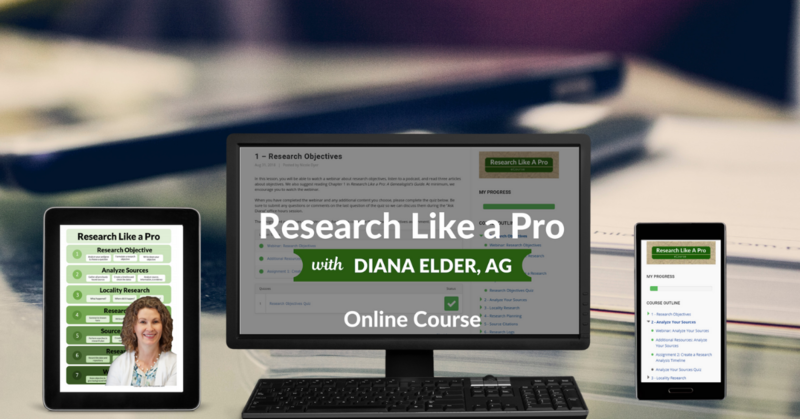 The e-Course will give you the extra boost you might need in your research efforts. You’ll be able to work at your own pace and still receive valuable assistance along the way. -Watch the webinars whenever it fits with your schedule. -Send your questions to Diana by email at Diana@familylocket.com. -Diana will answer questions in a live “Ask Diana” session once a month. These will be recorded if you can’t participate live. -Complete the assignments on your own time and share with the private Research Like a Pro Facebook group for feedback. -After you purchase the course, you will be able to see the “My Courses” tab on the menu to access the eCourse material. If you haven’t yet purchased your copy of Research Like a Pro: A Genealogist’s Guide, we encourage you to use the book during the course. Purchase a copy of the eBook or paperback at Amazon. Join the video chats live to ask your questions, or watch the recording later. All are encouraged to submit their questions beforehand by email. Check the web page for dates.